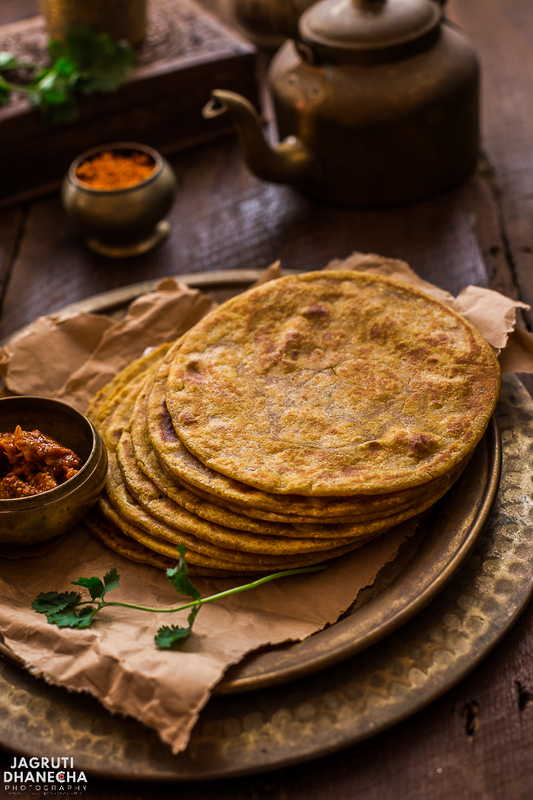 How to make Gujarati Masala Bhakhri | Gujarati Masala Bhakhri is a vegan, crispy and tasty wholewheat shallow fried flatbread prepared with wholewheat flour and basic spices that is mostly consumed at breakfast but one can have any time of the day. A quick traditional Gujarati breakfast, here is how to make Gujarati Masala Bhakhri recipe in less than 15 minutes. Because this Gujarati Masala Bhakhri is prepared with wholesome ingredients, which are loaded with all the necessary vitamin and minerals for our body, this nutritious breakfast is perfect for one and all. 'Gujju' in short for Gujarati People! Before various types of other regional Indian breakfasts and western readymade cereals, bread entered in Gujarati kitchens, Dhokla, Batata Poha, Thepla or Bhakhri along with Masala Chai, a glass of milk or Yogurt were the only few types of traditional healthy and quick dishes that were there to get the day going for hard-working families. 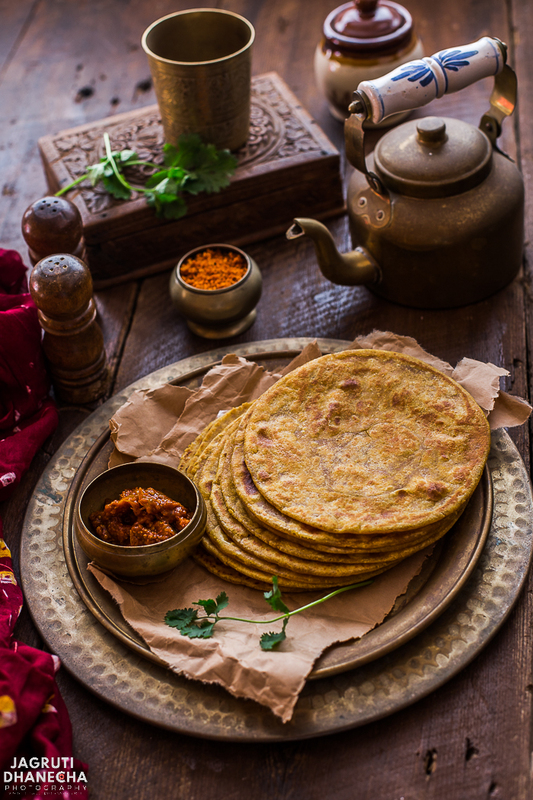 Bhakhri is a staple in Gujarati households, round unleavened flatbread prepared with coarse wheat flour. This wholesome and delicious flatbread pairs so well with yogurt, tea, curries and pickles. Bhakhri is somewhat similar to thepla or paratha, the only difference is in thickness. Bhakhri has to be thicker than thepla or paratha. There are two types of Bhakhri you can make, Sadi (plain) and Masala Bhakhri. Plain Bhkahri is only flavoured with salt and can be cooked directly on the heat just the way you make phulka, whereas masala bhakhri is prepared with basic spices such as red chilli powder, turmeric powder, cumin seeds and cooked shallow fried on a griddle with oil. Masala Bhakhri is not very strong flavoured, they are mild. They go well with Keri No Chundo, Gujarati Rasadar Bateta Nu Saak or Masala Chai. Bhakhris are perfect for the lunch box or travelling as they can stay fresh for a couple of days. To make this Gujarati Masala Bhakhri you will need the following ingredients which are basic and you can find in almost in any Indian kitchens. Wheat flour - To make Gujarati bhakhri coarse wheat flour is required. In Gujarati, it's called ' Ghau no Karkaro Lot' if you can't find, add a couple of tablespoons of fine semolina in normal wheat (roti) flour. Oil - Oil is a must for bhakhri, without oil bhakhri won't be crispy and soft inside. Spices and Masala - Cumin seeds, red chilli and turmeric powder and salt. HOW TO MAKE GUJARATI MASALA BHAKHRI? In a big bowl or plate place all the ingredients with 4 TBSP oil. Add water little by little and knead stiff but pliable dough. Divide the dough into equal portions and make balls. Roll one dough on a flat surface using a rolling pin without using dry flour. Keep bhakhri thickness more than normal chapatti. Heat griddle or tawa on a medium heat and roast the bhakhri on both side using oil. Gujarati Masala Bhakhri, delicious and wholesome breakfast can be ready in less than 10 minutes. In a wide plate ( parat or kathrot ) place flour, salt and oil. Combine everything, and add little water at a time and knead a hard but pliable dough. Cover the dough for few minutes if you have time. Once you are ready to make bhakhri, divide the kneaded dough into equal size balls. Heat the tawa on a medium heat, place bhakhri on the heated tawa. After a few seconds, turn the bhakhri other side and cook until you can see brown spots. Apply one tsp oil on each side, press the bhakhri with a spatula and cook until crispy ( On low -medium heat ). Ghee can be used instead of oil. I am such a bread lover. Trying the different breads of the world is wonderful. I really like the sound of this unique recipe. Bhakhri looks wonderful and so rustic; I'd love to give this a try! It seems easy to make and it looks so delicious! Would love to make it! I love trying new bread recipes (ok eating them too!) Thanks for adding step by step photos..this will be super helpful! This looks delicious, and very simple. I love that you included a history of this food. I am always fascinated by the meals of indigenous people and how people from other cultures eat, and live. Thank you for this delicious recipe as well as for the information about the culture from which it comes. I can't wait to try it. 15 minutes to a nutritional breakfast like this? Count me in! Fresh breakfast is my favorite and this is a recipe I should not skip. Loving this breakfast inspiration! We only think of Indian food for dinner. Gorgeous photography too! Why do you have to use coarse wheat flour? Would regular whole wheat flour work? Is it a texture or flavor thing? I don't have any semolina handy, but would love to try these! This looks amazing. The red chili and turmeric are a delicious and flavorful way to wake up the senses. This is definitely a breakfast I would be happy to see in the morning!